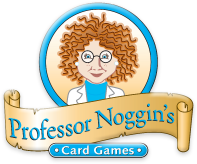 Professor Noggin's Card Games are available in fine toy, game, educational, science, museum, gift, and online stores. call us toll-free at 1-877-592-7374 or . Please include your Zip or Postal Code and the Title(s) you are looking for. You can also try one of our online retailers by clicking the links below*.